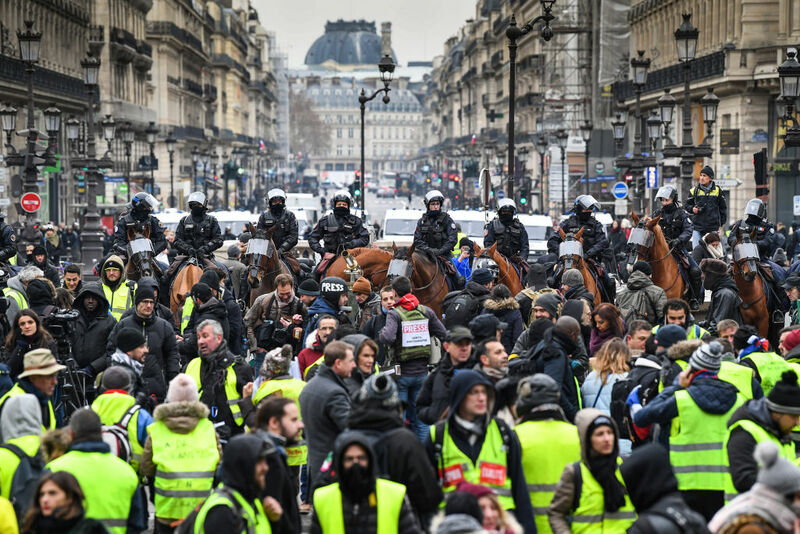 The gilets jaunes’ street demonstrations arose outside of trade-union structures. Yet their mobilization offers a historic opportunity to renew the labor movement. Since mid-November, thousands of people have donned their “hi-vis” yellow vests and met at road intersections across France to express their discontent with President Emmanuel Macron’s policies. This gilets jaunes movement was initially triggered by the fight against a rise in fuel taxes, as well as the buildup of social problems among the popular classes in rural areas and the continual weakening of local democracy. But its demands rapidly grew wider in scope. One first kind of demand concerned the improvement of living standards, starting from an increase in the minimum wage. Others sought a deeper democratization of French society, expressing a powerful desire for better representation. For the first time since Emmanuel Macron’s election in May 2017, he and his government doubted themselves and retreated in the face of a nebulous movement. A movement that seemed not only difficult to get a handle on but also to be aggregating new elements — including social movements in the suburbs of the big cities — as well as consolidating and radicalizing as the weeks went on. As the movement spread to various elements of the Left, the tone softened and it seemed that it might be possible to overcome some of these divides. But things did not turn out like that. The unions seemed left behind by a movement that rejected all forms of intermediation: the demonstration the CGT organized on December 1, intended to join up with the gilets jaunes, went totally unnoticed, as did Berger’s appeal for talks with the government. On December 6 an inter-union summit issued a communiqué condemning the violence and calling for negotiations; the following day, Martinez adjudged “a coming-together of struggles impossible, at the national level” and condemned the gilets jaunes who had reported clandestine migrants to the police. Yet he also called a strike for seven days later, to take place alongside the gilets jaunes demonstrations the following Saturday. Today, the gilets jaunes and the union confederations show a great deal of distrust toward one another. For the gilets jaunes, this is because trade unionists no longer appear as spokespeople for their material concerns, or even able to talk about wage concerns. The gilets jaunes, in turn, are suspected of a problematic amateurism evident in both their forms of action and demands. They are accused of having deserted the unions’ ranks, of having mobilized only belatedly and “outside the proper frameworks.” Yet if this mobilization arose outside of traditional structures, it nonetheless offers a historic opportunity to renew trade unionism in France. The union confederations’ inability to join up with one of the biggest social movements since May ’68 does much to highlight the weakened state of French trade unionism. With an average 8 percent unionization level among waged workers, France is the single Western country to have seen the sharpest decline of union density over the last three decades. The withering of French unionism is well-documented by sociologists and political scientists, with the disappearance of the “bastions” of worker organization, the rise of unemployment, increasingly precarious employment, outsourcing, and so on. Union organizations have been and continue to be confronted with major economic transformations, added to which is a substantial rise in the complexity of the work of representation itself. Staff representatives and union militants now have to take part in a growing number of negotiation structures both within and outside the workplace. As legal and economic rules have become studded with ever more exemptions, union militants have themselves needed ever greater professional training simply in order to be able to do their jobs. This has itself distanced them geographically and socially from the rank and file they are meant to represent. The question of representation has but accentuated the disconnect between union organizations and workers: given the prerogatives that they afford, workplace elections [i.e. in which workers vote between unions, to decide who should represent them] have become essential battlegrounds for union confederations, indeed a terrain which now makes up for a substantial part of their concerns and their activism. Moreover, for around a decade the world of French trade unionism has met with a series of major transformations that pushed it into a frenzied rush to adapt to the new mechanisms of employment and workplace regulation. With the “union representativeness law” under Nicolas Sarkozy in 2008, then the Loi Rebsamen and Loi El Khomri [Labor Law] under François Hollande in 2015–16 and Macron’s decrees in 2017, the unions now pass a considerable part of their time adapting to a legal framework that has constantly reduced their margins of maneuver. At the same time, unions’ voices and their expertise on the wider terrain of public policy seem, since the late 1990s, to have been banished from the workshops of sectoral reforms (for instance, on energy policy or on questions of labor or even transport). Today, trade union power has been chopped up by bargaining in individual workplaces, which sets the workers in competition among themselves. Since arriving in power, Macron has only furthered this disconnect by setting up Social and Economic Councils (CSE) that set out to transform trade unionists into “social” managers. A Replacement for Workers’ Struggles? The gilets jaunes movement thus clearly brings to light one symptom of these transformations of trade unionism: namely, that under the effect of the professionalization of trade-union work, union officials now seem out of step with the very aspirations closest to the heart of their bargaining work — demands upheld by many poor workers, struggling pensioners, or young temps who help make up the ranks of the gilets jaunes. The fact that this mobilization is taking place outside the specific context of the workplace sheds light on one further aspect of the situation of weakness in which the unions have been placed. A historic focus of mobilization, the world of work no longer seems able to rally sufficient forces to obtain basic social gains like generalized wage rises. This fight deserts the workplace, as companies become more complex (sub-contracting, the fragmentation of employment statuses, the distancing of the centers of decision-making, the social distance of the new generations of managers). It is now instead taking place on roundabouts, at road toll booths and at the edges of the towns. When this movement decided to demonstrate in Paris itself, the big unions struggled to go beyond their traditional marches, thus leading to the invisibility mentioned above. But there are far from just episodic cases of conflict over employment conditions in France: research shows a resurgence in labor combativity since the late 1990s, strengthening across the 2000s, and thus making France one of the most conflictual countries in Europe. Despite their common decline, at the start of the new millennium industry and the unions remained the main sector and the main actors in these mobilizations. Yet the overall rise hid disparities which instead allow us to hypothesize that conflicts over employment conditions are slipping outside of the workplace itself — a phenomenon of which the gilets jaunes would apparently be one further illustration. Though we can observe a continual rise in labor conflict over this period, it never managed to bring together as many participants as in days gone by, and it mainly rallied public-sector workers on single days of mobilization. The number of Individual Days Unworked in the private sector has thus fallen sharply — from over three million in the 1970s to a figure varying between 250,000 and 500,000 in the 1990s and 2000s — while mobilizations have also got shorter. Strikes shorter than two days have increased while longer ones have decreased, as workers have prioritized more indirect forms of struggle like walkouts, petitions slowdowns, or work-to-rules. Indeed, contemporary labor conflict is the product of both the tertiarization of the economy [the transition toward an increasingly large service sector] as well as the gradual same segmentation of the labor market and precaritization of employment conditions which seems to characterize many of the gilets jaunes. The conditions of labor mobilization have worsened as employment has transformed and become scarcer. This has made it ever costlier for workers to get involved in struggles, whether individually or collectively, and in particular in the case of workers on lower incomes. These latter often prefer to inform and indeed defend themselves by “using their smarts” rather than resorting to trade union action. Recourse to the industrial tribunals thus overwhelmingly concerns (at close to 94 percent of the total) “ordinary” individuals, and in eight out of ten cases it is a matter of challenging the justification for sackings. This inertia should above all be understood in terms of the new “conventional” means of breaking off contracts, which have spread without interruption since they were introduced in 2008. Yet this situation is less the result of any “amiable” reconciliation of disputes than a financial and institutional “exit route” from a multitude of potentially conflictual situations. In making the recourse to industrial tribunals more complex, and indeed access to this institution, Macron’s decrees end up snuffing out the last possible avenues for seeking justice at work. So are the gilets jaunes occupying the roundabouts continuing the fight over employment conditions, “by other means”? The little survey data thus far available tend — despite their inevitably fragile character — to corroborate this hypothesis. Among the gilets jaunes encountered by sociologists, around half (44 percent) have participated in a strike in the past. This level is particularly high when we consider that only one-third of French people declare that they have ever done so (see the BVA survey “Les salariés et la grève,” April 18, 2018). Some articles in the press have reported the presence of union representatives on the roundabouts, and union branches have been forthcoming in offering their solidarity. This continuum between the gilets jaunes and struggles on the job receives a little further confirmation when we look at the main mobilizations that have taken place in workplaces in recent years. An April 2018 BVA survey allows for interesting comparisons, here: while the gilets jaunes rapidly adopted the demand for a rise in the net minimum wage to €1,300 a month, this study shows that around half of the time (47 percent) questions of remuneration are the main origin of strikes within the workplace. In fact, contrary to another piece of received wisdom, workers rather rarely turn their noses up at their staff representatives, even if they may consider their activity relatively toothless. This identification is strengthened when firms enter into crisis: numerous recent studies show that during phases of restructuring, workers’ organizations appear as “incontestable” actors “whose representation gains strength, legitimacy and effectiveness.” During these periods, when the relations between workers and management are crystallized, we often see another dimension of the professionalization of unions on which researchers and the wider common sense generally accord little importance: namely, that staff’s elected representatives, aided by advisory boards, mobilize a set of knowledge and practical skills that very often allow them to create favorable conditions for defending and significantly improving the conditions that existed at the outset of the crisis — something the workers are often thankful for. Unprecedented alliances between different unions — the CGT, Solidaires, CNT — have recently allowed important victories for populations of workers perceived as very difficult to mobilize, like hotel maids or cleaning workers. Even if such cases remain rare, trade unionists even manage to save companies and avoid layoffs by challenging the arguments used by — and the management of — multinationals. In so doing they join the gilets jaunes in rejecting any fatalism as to the direction of economic policies. The strongest union reactions to the gilets jaunes movement confirm as much: the appeals to join the movement have mainly come from the lowest-level structures at the workplace and territorial level. To assert the possibility of such a convergence may seem to run against one of the main lessons of the aforementioned BVA survey. If the unions are less widely spurned among the gilets jaunes than political organizations, they do not seem to have majority backing among the protesters (64 percent do not want unions’ presence; the figure for parties is 81 percent). But we think that these data ought to be approached with a certain caution: other surveys have shown just how ambivalent workers, and especially the lowest-paid and most precarious, can really be toward union representatives. The critique of these representatives often in fact conceals the desire for them to be more present and/or to have a greater inclination to protest. In any case, the gilets jaunes movement is a historic opportunity for France’s unions to bring closer toward them whole swathes of a population that they have been seeking to organize for decades. Some union leaders have, indeed, understood this. The next weeks will be decisive for seeing if this union is, indeed, possible. Republished from La vie des idées . Maxime Quijoux is a CNRS researcher, sociologist, and political scientist. Guillaume Gourgues is a political science lecturer at the Université Lyon 2.